Tokyo: The 89th edition of the Intercity Baseball Championship, participated by 32 teams, attracted a record 40,000 fans to the final game at Tokyo Dome on July 24 and JX-ENEOS (Yokohama) beat the reigning champion Japan Railways East (Tokyo) 6-3. Earlier on the day, Madonna Japan, Women’s National Team, conducted baseball clinic to 150 girl players of under 15 at the Tokyo Dome (photo), courtesy of Japan Amateur Baseball Association. The 2012 Intercity Championship saw for the first time an umpire from Sri Lanka, Sujeewa Wijayanayake, and Sri Lankan ambassador, H.E. Admiral Wasantha Karannagoda, who attended one of the matches was very pleased to see him making calls in confident manner. 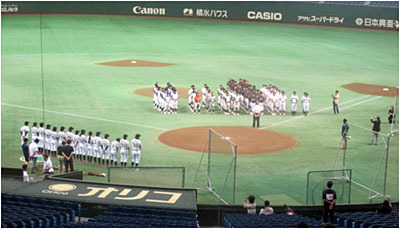 JX-ENEOS Baseball Club, operated by JX Nippon Oil & Energy is involved in social action programs, as with same as other corporate baseball clubs in Japan, and provides support for a variety of baseball-related activities including the All Japan Junior Softball Tournament and ENEOS Cup Junior Tournament.